As we've been working with the fine folks at the upcoming Sci-Fi London Film Fest, we've been authorized to share with you some of the UK premiers they'll be having. Yesterday is a low-budget Canadian zombie flick which looks quite good, but you know, around here at Quiet Earth we love this type of stuff. 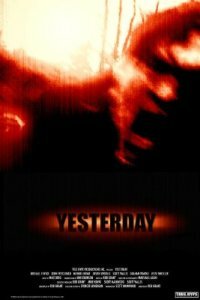 Yesterday follows the lives of complete strangers in the middle of a zombie outbreak. As each person struggles to survive we find their actions begin to affect the lives of others around the dying city, culminating in a stand off at the local grocery store. There, the remaining survivors decide to band together and flee to the wilderness. Once camp is built however, they find that the living dead are not the only danger as they begin to turn on one another in a struggle for power and control. The first half of the trailer was meh, but the second half was great. How many times do we have to see the same scenes in every zombie outbreak movies? Drug addicts and "crazy people"? News reporters being attacked live on the air? Survivors turning on each other? The genre is getting stale.